Home Uncategories Seagulls! Thanks To David C.
Seagulls! 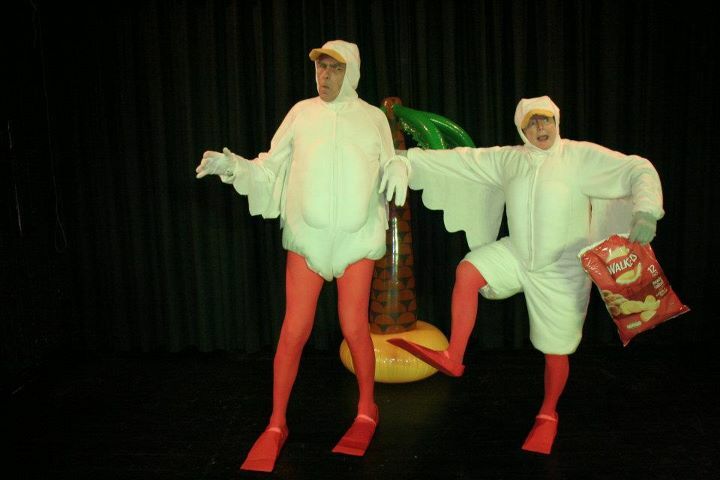 Thanks To David C.
Check out these Seagulls using our Microfiber Tights, in Orange (#1053), in a British pantomime stage performance! Thanks To David C.! I want to thank you so much for your excellent service. I needed to get hold of some orange tights in a hurry. I looked all over the internet and couldn't find any in UK....I have included a photograph of my friend and I in costume wearing the tights. We are supposed to be seagulls and this is how we will be appearing in a most British stage show, a pantomime, in a couple of weeks. We can't begin to thank you enough for your fantastic service and are spreading the word about "welovecolors" amongst all our friends in amateur dramatics. The pantomime went really well and the seagulls got great reviews thanks in no small part to feeling comfortable with our costumes. Thanks to we love colors for the fantastic orange tights!